Welcome back to Shibuya guys! A place where there are lots of the black suited salary men rushing by in the morning, lots of fresh high schoolers in the noon, and plenty of sound youngsters in the night. Surely, Shibuya won’t ever be a boring place for you since there are always lots of things to do, to find, and to make you always hanging around in this area, of course. Anyway, this post is the third post of Shibuya and this time I’m going to add more trendy things that we could find in Shibuya “The Core of Youth and Trend in Tokyo”. Okay then, off we go guys! 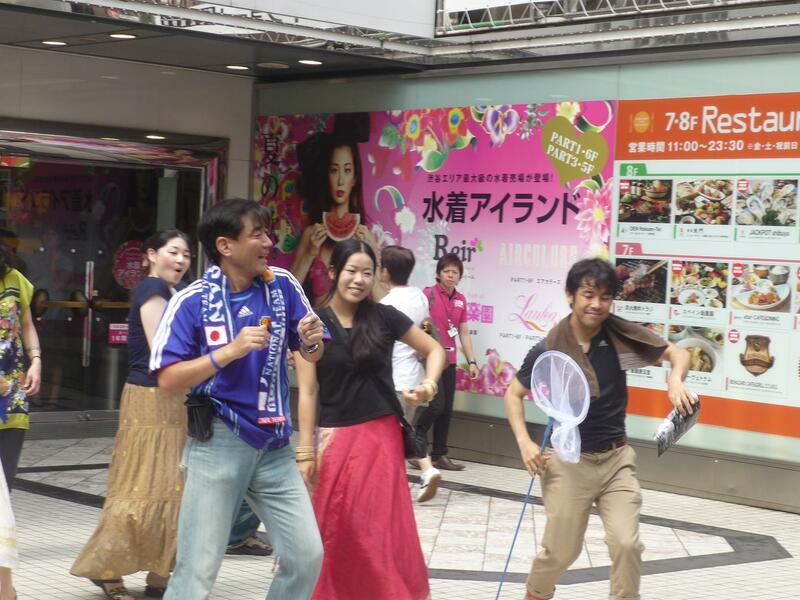 On the last post of Shibuya ( part 2), the last place that I covered was the giant department stores of PARCO. So now, before we leave that area, let us check that place one more time since there are some things I want you guys to know. First, if you are a serious shopping-fanatic then, you should pay a visit to this little store that looks from out of the world in the inside. 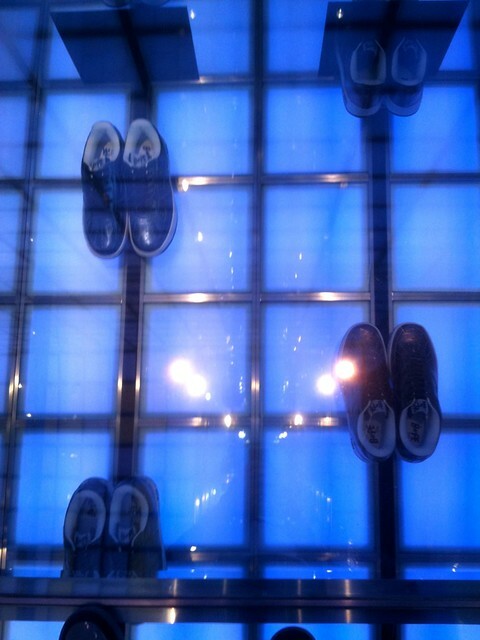 This A Bathing Ape Store! Since I was prohibited by the employee to take pictures inside the store, then the pictures below were taken from the other site. 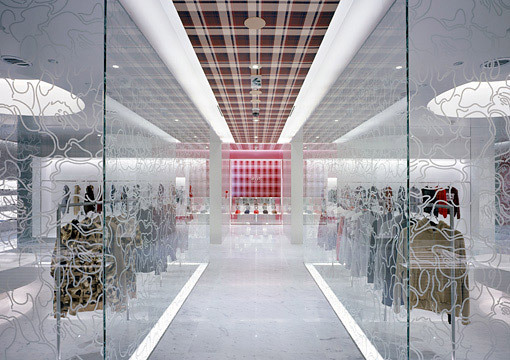 The design of the Bathing Ape stores are always as unique as this Shibuya store, thus, it will give you some out of this earth shopping experience where you couldn’t have in the other stores. By the way, the Bathing Ape goods are considered as high-class items, so don’t be surprised when you find out that most of the goods sold here are more than US$100. Next, if we take a look at the building beside the Bathing Ape store, we will find there’s a small cinema named Cinema Rise. Cinema Rise is one a the cinemas that we can find in the heart of Shibuya. At this Cinema Rise we can find lots of good quality of independent films. If you have some spare time when you’re around this neighborhood it’s worth to try to watch in this cinema. Around this Cinema Rise, I also found another unique and colorful design building selling and promoting a vitamin water. Looks like the vitamin water is one of the sponsors of this year Olympic in London. The building looks really refreshing eh? It was really funny to watch that gentleman-looking guy dancing in the front, led the dancers while shaking his big body left and right. When the dance was over, all of the crowds who watched them, including me, gave lots of ovations for the dancers. It was really entertaining guys! 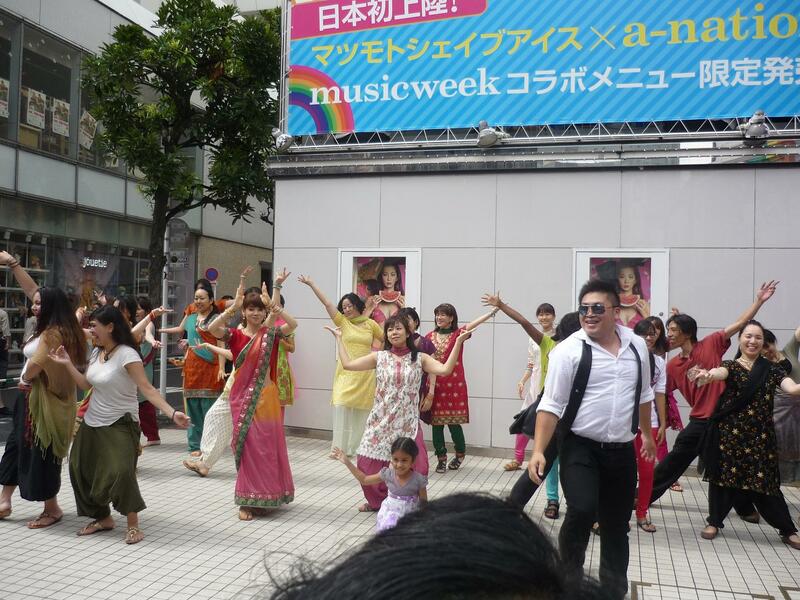 Anyway, if you guys are still wondering why they made a kind of dance performance in the middle of the busy Shibuya like they were running out-of-place to do their dance hobby, I guess this picture below would answer it..
Looks like at that time, there was an Indian movie in the cinema inside PARCO 1, titled Ra.One. 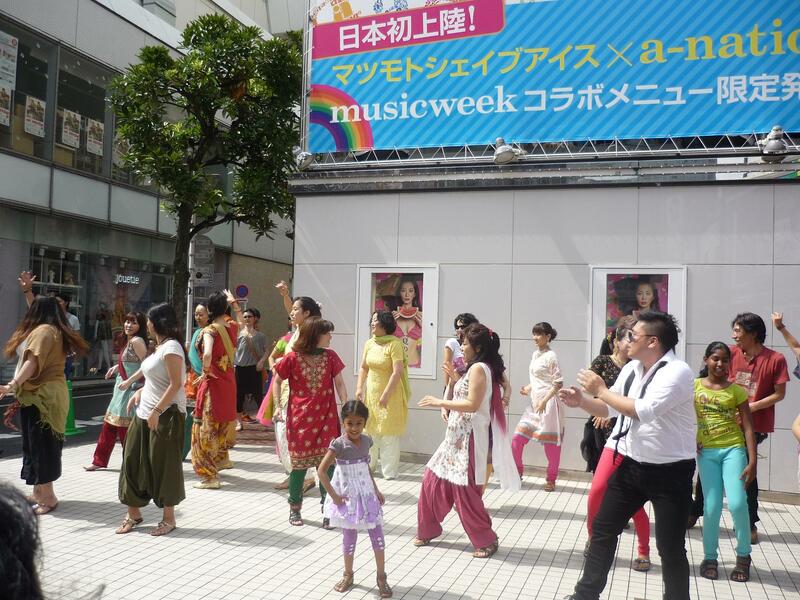 Therefore, I think maybe that dance performance was to popularise and promote the Indian things, especially that Ra.One movie that is starred by the famous Shahrukh Khan, to the Shibuya folks. Well, it’s such a unique and creative way to promote something, isn’t it? These kind of experiences which you can find everywhere in Shibuya are what make Shibuya become one of the top destination places to hang around for the Tokyo people. With lots of different things that you can find every time you are in Shibuya, it is obviously won’t make you ever say that you’re bored to go to this place again and again.